After spending a boatload of time creating a photo book, the last thing you want to do is spend a boatload of time uploading that book and printing it. That’s one of the many reasons AdoramaPix is my go-to company for photo books. Their book service is quick and user friendly. It’s just that simple. In my new class, Stories From the Road, I not only walk you though the photo book creation process, I also walk you through the printing process. I cannot wait to see what you create! Learn everything you need to know (and more!) about creating a themed photo book — from the dreamy beginning to the ordering end. This class will not be on sale again until Spring 2019. 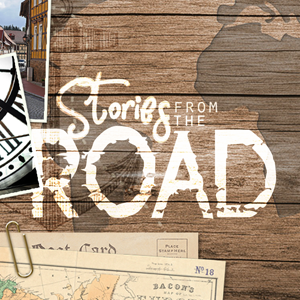 Learn more about Stories From the Road. Additional pages may be added at buyers expense. Where was the last place you vacationed to AND where are the photos from that vacation? Comments must be received before November 25, 2018, Midnight Eastern. NOTE: In order to be eligible for the photo book, the winner must be willing to share their email address with AdoramaPix. AdoramaPix will not share your information. Everyone who enrolls in Stories from the Road before the deadline will receive an extra entry into the random drawing for the free photo book from AdoramaPix. One winner will be randomly chosen from the comments below on Monday, November 26, 2018, 10AM Eastern. The winner will be notified via the email. The winner’s name will appear in this blogpost. The winner’s name will appear in the Digital Scrapper Newsletter. My last vacation was with my husband at a cousin’s reunion of my husband’s fathers family in Wilson, KS where their parents grew up. It had been about 50 years since they were all together and my first time to meet them all in person. The pictures are on my iPhone and PC. The last place that I vacationed to was Nova Scotia and Maine. Some of the photos are actually in a photo album. All the photos are in a picture folder on the computer. My last vacation was a blow-out literally. We arrived in Florida on Sunday and was told to evacuate Monday evening (mandatory evacuation) due to Hurricane Michael approaching. I have a few photos taken on that Monday when the beach was perfect and sky blue. Perhaps that one should not count. In June 2018, I went to Europe and on a cruise of southern Spain, France and Italy. Those 500+ photos are on my computer awaiting my attention to make into a photobook. I have never used AdoramaPix for photobooks so would like to. This question actually hurts my heart. So many wonderful vacations – the last one being to visit family in San Antonio Texas – but alas all of the photos sit on Google Photos, external hard drives and other cloud network resources. SIGH. My last vacation was to North Carolina to meet my 5th grandson who was born 11/15/2018. The beaches were not so pretty this time (they live close to Top Sail beach) as the hurricane has devasted the area. My daughter and her husband, (who is a Marine) is living in a camper as the hurricane destroyed their home and they are rebuilding. My photos are still on my camera card. Our last vacation was to Idaho to whitewater raft the Salmon River. We camped along the river several nights. It was an awesome trip! I took tons of pictures which are stored on two external hard drives. A last winter trip to the Big Bend Country in south Texas netted some neat pics that are stored in my computer and on an external hard drive. We stayed close to home this year and explored the Treasure Valley in Idaho to discover our home state. My photos are off my camera and into my computer and my external hard drive waiting for me to edit and scrapbook. My last vacation was to San Diego last January and the photos are on scrapbook pages I made early in the year and are being printed now in a photobook from Blurb I just ordered a few days ago. I print my scrapbook albums annually, every November. Went to Iceland in May. Pictures are on my computer. M all time favorite was a trip to Niagara Falls. Everytime I look at the photos my ears are filled with th roar of thr water. I wish I had my Dslr then rater than a digital point and shot. Having a view of the falls feom our hotel room at nigt and in the early morning was a great joy. My last vacation was a Mexican Rivera Cruise over Spring Break 2018. I am so proud that I was able to make a very simple gift album within months of the trip. I was on a roll as there was a huge sale that I wanted to take advantage of. Well, i missed that sale on the printed books as I had a few pages left to create and full consistency checks to do. The book sat for a few weeks, then I worked on it slowly and waited for the sale to come again. Luckily it returned by early summer, and I was able to not only print the book for myself, but also for all those that came with me. The last place I vacationed was a trip to the Panama Canal. Unfortunately, my photos are screaming at me to get to them to make a scrapbook. Have not done them yet and since we are in the middle of a move from Arizona to Texas, I won’t get to them for a while. My last vacation was travelling on a train through the centre of Australia, the train was called the Ghan and we travelled from Darwin to Adelaide. My photos are in Adobe Photoshop Elements gallery, on my computer. My family and I took a bucket list to visit my husband’s family in Barcelona. The photos are on the hard drive of my MacBook, uploaded to Shutterfly and on an EHD. My last vacation was to the eastern Sierra (California) where we visited Bristlecone Pines National Park and Bodie State Park. I made a photo book of Bodie, but my photos of Bristlecone are still on my computer and my EHD…waiting………. Our last big vacation was to the South West for 6 weeks, a year and a half ago. I worked on pages while on the trip….and had a book made within weeks of our return! Best way to do it! My last vacation was to the Grand Canyon, the north rim. It was for my 45 wedding anniversary and my pictures are on my phone. My last vacation was a Caribbean cruise with my sister and her daughter. The photos are on my laptop in a folder on the desktop but I do have backup copies on my EHD and a CD. My last vacation was going to Banff National Park last summer. The photos are in my scrapbook!! My last vacation was a cruise from Vancouver Canada to Hawaii. We stopped at 4 places in Hawaii. My photos are on my computer waiting to be scrapped. My last vacation was to North Carolina, a short trip to see my grands. Pictures are on an EHD and in Lightroom. My last vacation was to San Antonio & Austin Texas and my photos are still on my computer, half edited, BUT, I did manage to make a slideshow to share with those who shared my vacation trip! My last vacation was in Yellowstone National Park. The pictures are uploaded to my computer. We’re camp hosts in the mountain community of Idyllwild, California, meaning we’re on a perpetual vacation! Our four-year old, grand-twins came up for two weeks twice during the summer. Their older brothers joined them for one of the adventures. I just completed two 34 page photo/scrap books for the twins, which are already being printed. Last December, my hubby and I joined my grandkids and their parents at Disneyland for 3 fun-filled days. The photos are on my laptop, on an external hard drive and in Google photos. We took a wonderful 2 week road trip to Northeastern Arizona and western New Mexico learning the history of those areas. My pictures are all on an external hard drive and on dedicated SD cards and in Lightroom. They are in order by day, so my scrapping is ready to begin. My last vacation was to the Grand Canyon. And the best camera to use is the one you have with you, so they are on my phone. Our last real vacation was to Cozumel and the photos are on my portable hard drive. I actually made two digital scrapbook pages with some of the photos to go through some of the Digital Scrapper tutorials. My last vacation was to Iowa with my father. It is a cherished trip for me to have shared with him. I was fortunate to have had two trips with him last year. To date, I have made eight or so albums for him of his traveling adventures but this is very special because, this time, I am along for the ride. This was a first for me to go as an RV traveler and I enjoyed two wonderful trips with him. What a wonderful experience. I am finishing up the end of the first trip to Death Valley and three states of sightseeing from the first trip. The second trip is on my computer waiting to be sorted and put into printed memories. I have a folder of memorabilia that goes along with our story to add the fun and interest of the album. I have always done my own printing and put the pages into albums but I have never sent off a completed book of layouts to be printed into a book. It would really like the opportunity to learn how to do this. In August, I flew to Denver to pick up the my three G-Babies [5, 12 & 14] and brought them back to Mesa AZ to swim and play for a week before we head out to LegoLand, the tar pits and stayed at a wonderful hotel in Oceanside CA for a long weekend. Photos are still on the memory stick, in my desk. My last BIG vacation was a heritage trip to Finland  with my mom [84 at the time], brother and sister, after my dad died. As she had worked until she was 81, her former boss had collected enough money so that she could go and see her native land before she died. We took 6,031 photos and recorded 36 videos. Photos are still snuggled in three different backup drives, unedited. All the physical memorabilia has been placed in an airtight container and the soft copies are backed up too. My mom, now 87, just asked if I could print out some of the photos as she doesn’t like to look at the computer to see them all. She wants to see the cousins and other relatives that we met for the first time on that trip. I’ve been thinking about creating the album, along with a short video, as a surprise for her birthday in January. I also had planned to send smaller, family-oriented albums to the “new” relatives. Your timing is impeccable! I’m in for the class because I know I’ll get it done with your guidance and enthusiasm and I know I can finish it! I’ve been putting it off as that only other digital album I completed was for my parents 50th anniversary and that took six months and a lot of mistakes to complete. Thanks for offering this class Jen! My last vacation was to Tennessee to visit friends. The pictures are on my computer all dated and labeled and also on an EHD. Haven’t scrapped any as yet. I took my three kids on a trip through Midwestern USA. We circled north from Arizona and back, visiting 11 states in 13 days and enjoyed numerous national parks! We drove more than 3,000 miles and listened to three unabridged books. It was an amazing trip and I can’t wait to do it with my kids again (Route 66!). My pictures have been printed and are in a photo album. I’ve also uploaded them to the cloud. My last vacation was a trip to Seattle for a mini family reunion – this was in August. The photos are on my computer and I’m half way through creating my travel album. That being said of all the other vacations in the past 2 years only one has been scrapped and printed! I don’t get a chance to vacation much, but we did go to the beach for our anniversary. I made a scrapbook page out of the best one, but the rest are on my computer. My last vacation was on a river cruise last October in the Balkans with my since-kindergarten friend and her husband (and my hubbie, of course!) Our photos are on my computer and an external hard drive, and on my husband’s computer; some (a very small percentage) are already incorporated into digital scrapbook layouts. I’d love to make a photo book and send it to my friends. My last vacation was to visit my parents in Canada this past summer. My pictures are on my computer and backed up to my EHD and Crashplan. I have MANY vacations I have not yet put into photobooks, so I’m excited for this class to get me started! My last vacation was at our family cottage in the Bruce Peninsula, Ontario, Canada. Some of my photos have been uploaded to computer and portable hard drive; others are still on the SD cards. My last vacation (mini-vacation) was to the mountains in Idyllwild, CA. The driveway was so steep that I got out of the car every time we were going either up or down. It was scary. My first excuse was so I could take pictures :). The photos are still in my camera. They so need to come out to play! Our last vacation was a Caribbean cruise and my photos are on my computer and some printed in my scrap bag , ready to scrap at the next crop I attend. My last vacation was to the beautiful Southern Caribbean. All of my many pictures are on my Mac, also on an external and an online backup with Carbonite. Newport Dunes Beach Resort in our new RV. Pictures are still on my phone and backed up to the cloud! My last vacation was a Road Trip from Utah, across the bottom half of the US to St. Louis, Missouri, up through the states, and then back to Utah across the top of the country! It was such a great trip….Our last trip with my baby before she left on her own adventure! My last vacation was to Moab Utah for Scots on the Rocks Celtic Festival. The pictures are still in my phone! Our last trip was to Florida and then a family cruise. It was a blast! All the pictures are on my computer. It would be fun to make a book for the family of our trip! Our last big vacation was to Merry Ol’ England. Three couples rented a 45 foot cruise boat and we made our way up and down the non-tidal Thames (from Hampton Court to Oxford) for two weeks through a total of 50 locks. It was a relaxing and yet exciting trip with our buds that we have know for over 50 years! My photos are stored in a Trip folder on OneDrive (computer and cloud) and backed up to two more hard drives. Soon I will be creating a beautiful book of our memorable journey for each couple! My last vacation was to Kentucky last month, to visit family and friends and enjoy the fall foliage. The pics are still on the SD card. Really need to get them where they can be seen! Our last vacation was to South Africa. All of the photos and stories are in a book at just under 100 pages! My last vacation was in July in San Diego for a family reunion. The pictures are on my computer waiting to get sorted and scrapped into a photo book. Our last journey was to Ecuador where we lived for more than two years. Loved every minute there and have tons of photos on my computer, all backed up, but not being enjoyed much. I should make those memories more accessible to us and to our family. My last vacation was to San Francisco. My photos are on an external hard drive organized in a file. Since my daughter lives there I will probably combine the three trips I took this past year. My last vacation was to the New England States, Rhode Island, Mass and Conn. The pictures are still on my phone and computer. Last vacation was to Yellowstone and all the digital photos are stored in files by section of park, and many have been merged into PSE’d collages, at least one for each section/feature of park, All of these thousand-plus files are of course backed up both on cloud as well as on 2 separate detachable hard drives, ha ha. All files named for easy finding. Hee hoo. OCD here. We had an amazing family vacation to Bend, Oregon last August with our two grown sons and their wives, plus my husband’s sister and her husband. We rented a house close to town and near the river. I celebrated my 61st birthday there too. We simply spent quality time together, ate at great restaurants, shopped and floated down the river. By the way, AdoramaPix books are beautiful. I’ve been a customer and their book and page quality is the best. I’m currently on vacation in Sanibel FL. The pictures are on my phone but are backed up to google photos for now. Will add to my EHD when I get home. Virginia…the pix are filed on my hard drive. A few are posted on FB. None have been scrapbooked because I only scrapbook my time with my 4 great nieces and nephews. My last vacation was to Gatlinburg TN for a family reunion. My pictures are on my external hard drive in a dated folder and backed up to a MyCloud device. Last vacation was a cruise to 3 of the islands in the Bahamas in 2016 and the photos are organized in Lightroom. My husband and I went on an Alaskan Cruise. The photos are on my phone, and I uploaded them to my external hard drive. I have sorted them by date and place, and made the pages for our travel book. I’m just waiting to print the book. Our last vacation was to Newport, OR. I used my cell phone and transferred the photos to my computer. That’s where they stay. Our last trip was along the Great River Road to photograph fall colors and barns. They are currently backed up and in process of editing for a book. I think I enjoyed this trip better than our train trip to Grand Canyon in January to out Niagara Falls Ontario trip in July. This past summer my husband and I traveled in Ireland, England, and Spain. I posted many of my photos online, on Facebook and Instagram, and in a Google Photo Album shared with others who were on the same tour in Ireland, but so far I have not made any scrapbook pages or even had any of the photos printed. That’s why I signed up for Jen White’s class on making a photo book. Really want to get the photos off my computer or phone and into a book format! Our last trip was to Honolulu. The photos are on my camera and in the cloud! My most recent trip was to Oak Island, NC which was so fantastic…all before the hurricane hit the island. The pictures have been edited and are on my flash drive waiting for a winter photo book project. My last vacation was Breezy Pt. Minnesota with my husband. It maybe the last one with him because he is not in good health. The photos are in my camera and I will get around to them some day. My last vacation was with my niece in Nashville, TN for the Legacy Five Memorial Day Celebration (they are a Southern Gospel Quartet). The photos are on an EHD and also on icloud as I just used my phone this time, didn’t even bring my big camera. I’m planning to make a book for my niece for Christmas. we were stupid to go, but not to stupid to leave. I could take another vacation, get pictures and scrap that!!!!! My last vacation was a cruise to the Baltic. The pictures are on my Computer. Unfortunately, no vacations for me. I am busy organizing old pictures, memories and family histories, including Grandma’s 100th Birthday Celebration. Everything is on my computer. It is close to being organized enough to put in a book. Thanks for the chance to win. We returned from a Danube River Cruise in late September. My photos are on my computer and I am in the process of cleaning them up and organizing them. I also am getting pages ready to download to a book for a Christmas present. Thanks for the opportunity to win one of your books. Our last trip was to Japan. My photos are on my EHD and my computer. The “keepers” are in a photo book made with PSE, uploaded and printed with Shutterfly. My last vacation was to Ireland and my photos are on my computer. My last real vacation was a week long cruise, two years ago, that left out of New Orleans and took us through the Gulf of Mexico. My oldest granddaughter and her boyfriend at the time, set up the cruise for their combined families and was intended to be a “proposal” trip. Circumstances prevented that and the question got popped a few days after the cruise ended. The pictures are stored digitally in several locations, including contributions from various family members. We had a wonderful time regardless of the change in plans. They are happily married now and the two surviving grandmothers were the flower girls at the wedding! What fun, both the cruise and the wedding! Actually, I can’t remember when my last vacation was. With many years of being caregiver for husband and now mother (which I do gratefully and joyfully) I haven’t gotten away. Oh, I guess there was a cruise around Hawaii, probably eight – ten years ago. And, yes, the photos are still in my computer somewhere. I guess I do need to get those out and ‘re-live’ it. My last vacation was to France and London (October 2018) and the pictures are on my hard drive and I am working diligently to scrap them now! I’m about half way done! Our last vacation was to Utah and the pictures are on my computer and backed up to my EHD. Our last vacation was supposed to be to the North Rim of the Grand Canyon. Our truck broke down just outside Flagstaff and our fun vacation turned into the “Vacation from Hell” After a week and a half and a trip to the ER, we got our repaired vehicle back and were on our way home. Never did make it to the Grand Canyon. We did visit some sites in Flagstaff before I ended up in the hospital. The pictures are downloaded to 2 external hard drives. One is backup to the other. I haven’t wanted to scrap them yet, LOL! My last vacation was to Maui Hawaii. My photos have been uploaded to my computer and I have turned them into a printed photo book. My last vacation was to Nagoya, Japan where my husband and I visited my son and his family. My pictures are on my computer, external hard drive and the cloud. They will soon be made into a scrapbook (at least that’s my plan)! Our last vacation was to Bear Lake, Utah and all of our photos are on my Mac waiting to be given a place in the free AdoramaPix book that I am going to win! Thank you! My last vacation was to Ketchum, Idaho to go fly fishing. The photos from my camera, my husband’s phone, and my phone are all now on my computer, waiting to be scrapped (in a year or two). My last vacation was with 2 of my 3 sisters. This past August, we traveled to Faribault, Minnesota (home of the Tilt-a-Whirl) for our Dad’s Family Reunion held every other year. It was my first time attending the event, and I was quite overwhelmed when meeting 325-ish (no exaggeration!) family members, and that’s just my Dad’s side! My photos are on my external hard drive, and are backed up with Backblaze. I will be making a photo book for my two 88 year old Aunts, and, after post processing, will put all the photos on a jump drive and send them to the family historian. For our last vacation we took our granddaughter to Colorado Springs, CO this past May. Her first time there. The photos are on my computer and also backed up to another drive. Our last scrap-able trip was a land and cruise adventure to Alaska and the Yukon territory. My husband did his part by editting the photos from our four devices (his and hers cameras and his and hers phones). They are on my computer. I’ve separated them into folders for easier scrapping, but that is about as far as things have gone. I have been distracted by the 5 banker boxes of photos and memorabilia from 12 vacations my mother took – I rescued them from her piles of stuff as we were moving her into assisted living and promised to turn them into photo albums she will enjoy. Monster project! Our last vacation was to the UP and Mackinaw Island. The photos are in my pictures folder under the year and month. They are sorted by which device they were taken with—whose phone, iPad, camera. Then sorted by date and place. I have begun an 8X8 book for them. My husband and I went to Savannah, Charleston & Myrtle Beach a year ago. My photos are still on my computer, but I have edited them, organized them and labelled them – getting ready to make pages. Our last vacation was to Boston. We had never been, and the sights were amazing. My pictures are on my computer and on a backup EHD. Haven’t had time to create my travel book yet. We took a Baltic Sea cruise and the pics are still sitting on my EHD. My last vacation was a camping trip to the area around the Dworshak Reservoir in Idaho State. We were totally off the grid—-no electricity, cell phones or internet. This is the best way to be with people. I took a number of batteries—so I was about to photograph everyone and all our fun times. So where are the photos? I shared all of them with those who were there. But the originals are still on my computer. Help. Long weekend in NYC with beautiful blue skies and Fall weather. Pictures are on my phone. Thanks for hosting the drawing! My last vacation was at the Oregon coast. My photos are on my hard drive and backed up to an EHD. I went to Pasadena earlier this month for SketchKon and also to see my grandkids and family nearby. The photos are on my computer’s hard drive and on my camera and iPhone. Last traveled location was Minnesota with lots of grandkids’ pictures that are on my computer! My last vacation was to Disneyland this last summer and the photos are on my computer. My last vacation was a road trip the Grand Canyon, Bryce Canyon, Zion, and Arches National Park with my husband and a very good friend. My photos are saved in a folder on an external hard drive and on my computer. My last vacation was an Alaskan Cruise. The pictures are on my computer, EHD, and Amazon Photos. Last vacation was to Las Vegas and Minnesota. The photos are in a folder on my hard drive as well as a few are posted on FB. There is a Las Vegas vacation(s) book in the making. Our last vacation was to our daughter’s wedding in Texas. All of our children were there and even my sister and her family were able to make it to this special event. I was thrilled that all of our children were able to enjoy this event together and share some special time together. This is a very special time for me because this was the last time my oldest was alive. He passed unexpectedly 3 months later. Fortunately these wonderful pictures are on my computer waiting to be edited. My last vacation was a short trip to the beautiful Georgia Cloudland State Park, and Chattanooga, TN. The photos are on my hard drive – and backed up – and some of the scrap pages are finished. Our last vacation was a New England/Canada cruise – 14 days! The photos are all organized on my computer and a photo book is on my to-do list!! Would love to get them in a book. My last vacation was to Italy with my two sons. The photos are digital and in my computer (and my backup drive. I would love to make a book of these. My last vacation was in Branson, Missouri last week. My pictures are still on my phone. Our last vacation took us to China. I used Adoramapix to print two albums for a total of 100 pages. The books set on our coffee table, not only because they are decorative but enjoyable to peruse. The last trip that I took was to Disneyland! Unfortunately the photos are still on my phone and on the backup website. It’s been really busy since I’ve been back but that’s no excuse. I know better to at least get the pictures over to my computer and organized! In June of 2018, I visited my sister in Ottawa, Canada to have fun with my nieces & celebrate one of the girls 10th birthday. All beautiful photos are still in my phone & camera just waiting to be turned into pages of a photo book. My last vacation was a couple of years ago on the Oregon Coast. We stated in lovely condo overlooking the beach, and loved watching people walk their dogs, fly kites and beachcomb. It was wonderful. I have my photos stored in my iPad within easy reach. The last place I vacationed was Zion National Park. My photos are on my computer and a hard drive back up. Our last vacation was to the Catskills in NY. The photos are edited and sorted on my computer, ready for scrapping! Last trip was to Osoyoos, BC Canada and my pictures are stored on my laptop computer and in a backup. Vacation, what’s that – lol… we did take our son to Disney when he was about 4 or 5 (he’s 19 now). We met up with another family and it was quite the adventure – from the car trip down there where a hotel that we wanted to stay at burned down but we stayed at the ‘cheap’ spot next door cause the kids were sick and throwing up all night (who would of thought that was a blessing?) to the stopping at every bathroom at Epcot to my son ‘goosing’ Snow White at the Princess Breakfast… ah the memories. This was before the cell phone camera so many of the pictures are on disk drives or on the CDs. I’ve made many attempts to scrap the event but it is still in various in process pages – both digital and paper! But it is on the list. I sent my husband and 90 year old father to Alaska. It had always been a dream of dad’s and my husband as well. They did the guy thing and had a very special time. The photos are organized on my computer. My last trip was to Boston and New York. My pictures are on my computer and I am in the process of making a book in photoshop! My last vacation was in NW Wisconsin. The photos are in my computer, not sorted, not tagged, and the bad ones have not been deleted. They have been backed up onto a hard drive. The last place I visited was Spain. My photos are on my computer, sorted, tagged, and edited, just waiting to be published. Our last vacation began with a flight from Chicag O’Hare, folloed by a 30 day cruise around South America from Rio de Janeiro, Brazil to San Francisco, California and a return flight to Chicago Others. Unfortunately, the photos are still on my hard drive. Too little time, too many projects to complete. Still on vacation in Chile (1month). My photos are still accumulating on my camera and I still have two more weeks before I return home and wonder where to begin documenting. Yikes, I am so looking forward to Jan’ s class to help me out. Our last vacation was in 2015, a fantastic European cruise for our 25th wedding anniversary. Little did I know at that time that I would be laid off from my “forever” job just three months later, and sadly, I’m still not working. You would think that I would have found the time to go through all my photos and create that wonderful memory book. Pfft, no sir, these photos are still sitting on my computer waiting for me to do something with them. I enrolled in Stories from the Road as soon as I received the email … I’m hoping that its just the push I need to get working on it. The last place we vacationed was Siesta Key Florida with my husband’s family. The pictures are on an external hard drive. I need to print more. The last place we vacationed was in California. We took a trip with our Sun City Group (55+older community). We went to Napa, Paso Robles, San Francisco, Hearst Castle, and the Missions Inn in Riverside, CA. Where are the photo’s now? They are sadly on a disc. I got as far a downloaded them from my phone and onto a disc. Very sad as there are some wonderful pictures and memories. Age and a neurological condition have put an end to vacations as such; however, we last went to the beach with all of our family in 2012, I believe. The photos are on my computer and an EHD, and they are also in a photo book. Hurrah for me on that one. Thanks for the chance to win an Adorama book. Their books are the very best quality, in my opinion. Our last big vacation was a cruise across the Atlantic to Europe. The photos are in a folder on my computer desktop, waiting for me to make a photo book. The last place I visited was Greece. The photos have been loaded onto the computer but I have yet to work with them other than put them into the organizer. However, before I downloaded them, I went through the 10,000 photos on my iPad/iPhone and deleted and organized them to get ready to download them and take them off my iPhone/iPad. We have only been home since Halloween. I think I have done well. I am anxious for the class to begin. My last vacation of note was to Canada for the women’s World Cup championship. I went with my then 80 year old mother. The USA women won the tournament for the third time. I had to watch the final 5 minutes of the game on a monitor in the health center. I fell on the stairs. All of it was worth it. The photos are in my amazon photo drive, my Carbonite backup, and my local Apple time capsule. I keep 3 copies of my photos and all my digital scrapbooking supplies. Too precious to lose. The last place we vacationed was in September at Whistler, British Columbia. And, oh oh, the pictures are still on my phone camera. The shame. Lake Powell. Granddaughters took pictures and posted some on Facebook. I am so excited for class to start. And it would be the frosting on the cake to win this book! The last placed we vacationed at was at the San Antonio Zoo & the Alamo; those pictures are still located on my phone…SMH!!! Montreal. The photos are still in our cameras. My last vacation was two weeks in Alaska where my son is stationed in the USAF. The best part of the vacation was spending time with him, but the scenery there inspires me to make many more trips back. We took a boat trip out of Seward to see glaciers, puffins, seals, whales and a calving glacier. My son and husband went halibut fishing out of Homer while I enjoyed the local sites and took pictures. We went to Denali to see the mountain and were rewarded with a great view and also bears, caribou, and eagles. We went to a reindeer farm and a musk ox farm and saw great animals. Many more sites and experiences made up our trip and it was wonderful. The last place we vacationed was Colorado seeing our oldest daughter and family. All my pictures are from there. I don’t think I got the camera out much after that! The last place I vacationed to was Nashville, TN four years ago. The pictures are still on my camera and phone. I been away from doing any digital scrapbooking because of fighting cancer, and now really want to get back to creating some good memory. A Caribbean cruise with my best friend is the last place I vacationed. The photos are scrolling on my laptop. My last vacation was to Minnesota, South Dakota and Colorado, in an RV. There were 8 of us, kind of crowded but fun all the same. The pictures are still on my computer, waiting for me to put them in a book. Thank you for the chance to win. Our last vacation trip was to South Africa for safaris at the beginning of October this year. All the photos are on my computer and I am slowly processing them in Lightroom. SLOWly is the operative word! Once I process the raw images, I export them as jpg to a new folder. That folder is where I will finally create the pages from. Last trip almost 2 years ago is still not done being processed, but I am a bit further along on the South Africa ones!!! If anyone watches SafariLIVE shows on YouTube or twitter (every day, twice a day-live, that is where we spent 10 days of our trip, then we went on to a luxury camp which was wonderful. The last place we went for a short vacation was to Phoenix, Arizona to see our niece. The photos are on my phone. As a retiree I vacation everyday in beautiful Arizona. The gorgeous scenery as well as the abundant wildlife provide unlimited photography chances for photobook subject!! I am from Texas but in 2008 I was living in Holland with my Dutch husband. We came to the US on our last vacation together and travelled from Texas to Ohio to Tennessee and then to Atlanta Georgia before returning to Texas. It was a magical trip for both of us, but three years later he was gone (cancer)and the pictures remain on my external hard drive, unseen but not forgotten. My last vacation was in July to Panama City Beach, Florida. My photos are on my computer being edited. My last vacation was in Florida with my best friend Francine. We celebrated my 60th birthday together. Girls having fun. All my photos are in my computer. I traveled to the Eastern Caribbean on a cruise. My pictures are on my computer. Knoxville, TN and the photos are on my computer. I’ve been working on a photobook, but haven’t finished it yet. Last trip was to WaltDisneyWorld, our favorite vacation spot! My photos are safely stored in the cloud and accessible on my pc and my phone. Backups are on two different pc. I learned my lesson long ago about losing precious photos. Last big holiday was in the Rain Forest in Costa Rica. The pictures are on my computer waiting to be placed in a book….just as you might expect! My last trip was a cruise of the Danube River in September of this year. I have the whole thing scrapbooked! Yea! Unfortunately, my prior trip 4 years ago still remains in digital pictures on my computer. I am signed up for your class and will probably use this trip for the class. I’m anxious to see what the book looks like since my only experience is the regular scrapbook and I use the 11 x 8.5 format and print at home. This will be a totally new experience and I am looking forward to the new learning experience. My last vacation was October 2018 in Croatia, Slovenia and Italy. In Croatia I’visited Dubrovnik, Mostar, Split, Trojir Island and magnificent Plitvice Lakes National Park. Then I travelled to the capital of Slovenia, Ljubljana, then onward to beautiful Lake Bled. I finished the tour in picturesque Venice Italy. Palm Springs California pictures are in a shared google drive and on my phone. The last place we vacationed was the Delaware Seashore State Park in Rehoboth Beach, Delaware. The pictures from that trip are in an appropriately labeled folder on my External Hard Drive waiting to be formatted into a digital scrapbook :). How timely this new class is for me! I will be getting it as soon as it is available. My brother from Holland was visiting last summer; with him we traveled between Vancouver, British Columbia and Edmonton Alberta, taking different routes going and coming back. Now I have lots of photos, both from his and my camera. For now they reside on my computer’s hard drive, with a back-up on an external drive. I have been going through previous DS classes, as well as through the “old” monthlies, looking for ideas, elements to add, backgrounds, etc. Slow going, but because I want a “nice” book for my brother and for us, I don’t mind taking my time! Our last great vacation was a trip across Canada from east to west coast. Our major destination was to reach Dawson City, Yukon. All my photos are stored on an external hard drive. The last vacation I had was a couple of years ago and it was a cruise to the Bahamas. My first cruise! The photos sadly are still sitting on my computer. North Carolina…….beautiful smokie mountains! The photos are- of course- on my computer because I’m still trying to scrap LAST years RV trip out West!! My husband and I spent two weeks in Japan to visit a son working in Tokyo. The photos, the best ones, have all been compiled in an 8.5×11, (so I could used my printer) photo book using Photoshop–30 pages. I have two copies, one for him–to thank him–and one for us. Last vacation was a 2 month drivng trip across the United States, into Canada and then to Alaska. Our son is in the Navy and is stationed in Anchorage. My pictures are on my camera, my Ipad and my phone. During our trip we saw several friends, attended my 50 th Class Reunion and many National Parks. We played golf in Canada and really enjoyed seeing things in Alaska. Some of the highlights of Alaska were seeing the Alaska Pipeline and Denali along with great time with our Son, his Wife and our Grandchildren. It was a trip of a lifetime. We just returned from the adventure of a lifetime to Brazil, Argent, and Chile. I admit, the photos are still in my camera and iPhone! The last vacation I took was to Nashville and my pictures are still on my phone! The last place we vacationed was the Big Island, Hawaii and the photos are in scrapbook layouts in our album. I just returned home from a wonderful vacation in Williamsburg and my photos are on my phone. My husband and I made a trip to Ireland, spring of 2018. Since it was one of the countries our ancestors came from it was very special, even though it was raining and cold most of the time. The country is beautiful and the people so friendly. My pictures are on my computer, waiting to be combined with another trip to Europe from several years ago. Would love to win this book. Can’t wait to start your class on Friday, better than shopping any day. Our last vacation was to Branson, Missouri. My photos are in a folder on my computer and in my phone cameral roll album. Thank you for the opportunity to win a photo book from Adororama Pix. They do such a beautiful job. Linda H.
My last vacation was to Tennessee last March. We went to Nashville, Memphis and Dollywood. My photos are on my computer and backed up in the cloud. Last place we vacationed was Kruger National Park. Glad to say photos are well on their way to our 2018 memories book. Pages are made but I print once a year. We went to Florida. The pictures are on a disk. In October, we took a quick overnight trip north to Erie, Pennsylvania. We visited couple of wineries, sampled some wine, bought a few bottles. Stayed at a wonderful B&B in the town of North East, Pennsylvania. It was a great getaway! The photos are on my laptop hard drive. Well, I with my husband took a cruise with Princess to the Eastern Caribbean Islands in 2016 and the pictures are in the computer which I am currently looking for ! Costa Rica and Panama; digitally saved on my computer and back up drives. A few posted on Facebook,Flickr, and Smugmug. The last vacation was a month long trip through the Midwest with stops along the way to see Roadside America. The main goal was to see the headwaters of the Mississippi River. The photos are on my computer, on my camera chip and on my back up drive. Some are on pages already, but lots more to get scrapped. Can’t wait to get started on my Stories from the Road project! I’ll work with photos from my vacation to Maine and Nova Scotia. Some of the photos are on Smugmug, but all of the photos are on an external hard drive. The photos are still in my Photos app on my handheld device. The last place I vacationed was to Prospect Harbor, Maine. We spent the weekend in a lighthouse watching waves from a storm crashing on the rock sea wall. Stunning! The photos are safely printed in a Shutterfly photo album for all to enjoy. Excited for the chance to try Adorama Pix. Thank you! Rhine River Cruise in 2017 was last big vacation. Fabulous fabulous! Pics were hastily printed out with no editing as we were meeting friends we had vacationed with and wanted to label and “ story” them. They currently residing on the computer and in a box awaiting attention. 2018 vacation is yet to occur. Florida Gulf Coast and the pictures are on my phone! The last place we vacationed was Disney World/Universal Studios in Florida. I’m still creating the layouts for them, but having a blast reliving the memories and getting help from the kids with the journaling! My last vacation was at Falcon Trails Resort in Manitoba Canada and the photos of that lovely escape to the lake are in a folder ion my computer, waiting for a home in a beautiful photobook. I went to Sanibel Island Fl and Key West fl and my pictures are in my computer. Ecuador – Quito, the Galapagos Islands, and the Mashpi “Cloud Forest”. My photos are on my ancient desktop, my laptop where I do all my scrapping, a thumb drive for backup, and they’re still on the camera just in case all those things fail. I’m not erasing them until the scrapbook is done and in the mail to me. Our last vacation was to beautiful Sanibel Island in Florida. I have tons of great photos. All in the cloud or on the phone where else lol. Its one of those “round to its”. Eventually would love to bring them back to life and relive the experience. Our last vacation was a Golden Wedding celebration taken aboard a river cruise along the Rhine from Amsterdam to Basel this last summer. The frequent stops and guided tours were conducted by very knowledgeable guides with a generous sense of humour and self deprecating comments. There were endless opportunities for photos, but as with such tours, it was difficult to avoid others busy photographing the same attractions. There was no time to wander and size up the best angles, nor to return when the sunlight was better. There was a lot of pleasure in processing the pictures; selecting, editing and preparing a slideshow with music of the whole trip. Friends and relatives were most interested in the results, and envious of our chosen holiday. In September we took our little caravan to County Kerry on the West Coast of Ireland. We camped on the Wild Atlantic Way, which was wonderful. My photos are on my photo external hard drive. They are processed and ready to go into a digital album. Thanks for the chance to win. I vacationed at Lake Geneva, Wisconsin. The photos are on my iPhone. My last vacation was in New Castle, Colorado in October, my photos are downloaded, but not edited yet, and live on my computer. I went on a cruise to Alaska. The photos are still backed up to my cloud account. This will be a good start for the Stories from the Road class! I last vacationed in Rosewood, NSW. The photos are still on my phone. If perchance I happen to win what is the postage cost to Australia? In June we went to a fabulous beach campground on Myrtle Beach called Ocean Lakes Campground. The photos have been edited and are waiting patiently on my external hard drive. My last holiday was to Norway and Iceland and the photos are still on my computer. Last vacationed in Korea. Photos are on the computer. We just got back home to San Diego from a cross-country vacation to Orlando, Florida. Lots of pics taken, even some of the devastation left behind from the hurricane. The photos are still on my iPhone and in “Photos” on my Mac. Looking forward to your class – Stories from the Road! Hawaii was the last place I really vacationed — and the pics are on one of my many hard drives. The memorabilia in a file folder. The story untold. The trip was a gift for us to accompany my father-in-law to a reunion with his Navy comrades that he served in the Korean War with. It was a fabulous trip! So many experiences, emotions and stories. Intended to make a book to share with him when we got home. Life got busy and it didn’t happen. By the next year, he had passed away. Not having had a chance to enjoy his story / his trip in print. Breaks my heart and provides a reminder to tell the story NOW as it is happening or as soon as possible afterwards. My last vacation was to the Jersey Shore (specifically Sea Bright) to see my son, 2 1/2 years ago. It was a fun trip , but my photos are still on my computer where I downloaded them from my phone. My last vacation was traveling to Big Bear, California for my parents-in-law 50th anniversary. The pictures are on my computer hard drive and my backup EHD. I really need to make some pages!